These days, competition for business school isn't just tough, it's brutal. Everyone wants an MBA. So how do you stand out in the crowd? One way is to net a high GMAT score. But you're a busy undergrad: you've got classes, a job, your life. How are you going to find extra time study? We've got you covered. Our experts have completely broken the GMAT into pieces and put it back together again. We'll guide you through all that tricky Data Sufficiency, help you navigate reading comprehension, shore up those grammar skills for sentence correction... we'll even walk you through the perfect analytical writing assessment. And the best part? 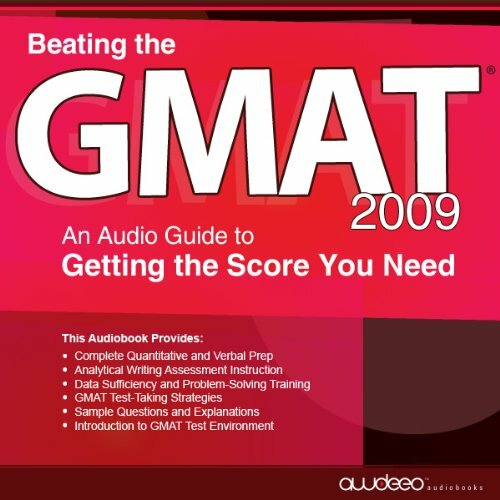 You can take us with you wherever you go and get all the strategies you need to beat the GMAT. We can practically hear that MBA calling your name. Good way to get some extra review in while driving. Not going to be a total replacement for the practice tests and books, but I found it to be a great supplement. i bought this with the assumption that i can burn it to CD for listening but there is no format available for CDs. the audio is in a .aa format. waste of money. i would rate this a zero but they don't even allow that.